Ever since I first started watching The Office six years ago, that line has stuck out to me. The Office has seen better places to stop and produced better episodes to stop on – season three’s “The Job,” season seven’s “Goodbye Michael,” and even the deeply flawed season six installment “Niagara” spring to mind – but at the very least “Finale” finally returns to the idea that Jim and Pam are limiting themselves by working at a paper company amongst underperforming, unmotivated employees. The show didn’t go the scorched earth route it feinted toward earlier this year (an outcome I would have preferred), but “Finale” is likely the best episode we could have gotten from this show at this late date. It was often sappy, sometimes funny, occasionally affecting and frequently unnecessary, and it closed the books on some of the characters in satisfying ways. It also had Michael Scott in it, which is more than you can say for any of the show’s other episodes in the last two years. In short, it was the only finale The Office could have, one that is illustrative of what the show became in its nine years of existence. Inasmuch as the finale was flawed, it was so for the exact same reasons the show became flawed in its later seasons: it skewed too far into sentimentality and abandoned the cruel, more realistic eye that the show’s early seasons were known for. Inasmuch as it was good, it was so when recognized its characters as they are and rewarded them appropriately. The show itself often fluctuated wildly in quality depending on those factors. The show’s first two seasons are noteworthy for their cringe humor, borne out of an unflinching desire to portray Dunder-Mifflin – Scranton as a soul-sucking place from which only a few deluded or distracted souls could find joy. Consider episodes like “Health Care” and “Michael’s Birthday,” in which Dwight and Michael respectively are made out as almost villainous in nature – a sympathetic villain, in Michael’s case, but a selfish, unbalanced villain nonetheless. Those episodes might not be our favorites, but they’re fascinating in their audacity, in their willingness to dare the audience to watch a show with such broken protagonists. A business professor at the college I attended once told her class that it took her a while to realize that The Office was a comedy and not a slightly over-the-top drama, and I understand why. The Office was, at one point, a show about working at an exaggerated version of an office, and all the real personality types you might meet at one. In this form, it was also one of the best comedies on network TV, and Season Two remains a gold standard that subsequent years cannot tarnish. Even the characters we were supposed to like had significant flaws, from a chronic complacency in Pam to a lack of initiative in Jim. Besides the four or five main players, most of the rest of the cast portrayed personifications of one or two personality traits; most of those traits made for pretty terrible employees and human beings. Kevin is the stupid one, Kelly talks too much, Stanley sleeps at his desk, Meredith’s the alcoholic. We don’t need these characters to be very fleshed out; in fact, that’s one of the reasons why they’re good. Their larger-than-life foibles provide the fuel for the engines that power the more complex Michael, Dwight, Jim and Pam. However, as the show became more popular, the people in charge began to make some changes. Perhaps these changes occurred naturally, or perhaps the writers realized – quite correctly – that American TV audiences don’t have the stomach for watching only halfway sympathetic people suffer at the hands of completely unsympathetic people (just ask Arrested Development). Whatever the case, the number of traditional office plots slowly waned, and the number of character-driven plots, both comedic and serious, began to increase. To a certain extent, this comes with the territory of writing for a long-running TV show, particularly one that’s so specifically oriented. I work in an office, and I certainly couldn’t come up with nine seasons of office-related sitcom plots. The problem, however, is that as the writers tried to coax some dimensionality into the outlying cast, it did so at the expense of sanding off some of their rough edges – i.e., the reason the characters were funny to begin with. Along with that process comes that deadly sentimentality. When a TV show tries to force you to like a character with little to no redemptive value, experienced viewers can sense the maudlin manipulation from a mile away. When “Finale” had a line of documentary fans cheering “Nard Dog” at the sight of Andy, it felt hollow, because the only way a real person could like a character as downright sinister as Andy became in the show’s last two seasons is if he was fictional. The show’s momentous episodes have felt this way for a long time. “Niagara” has great Pam and Jim moments, but it also makes no sense that the pair would invite the entire office to their wedding, or that the entire office would dance down the center aisle. 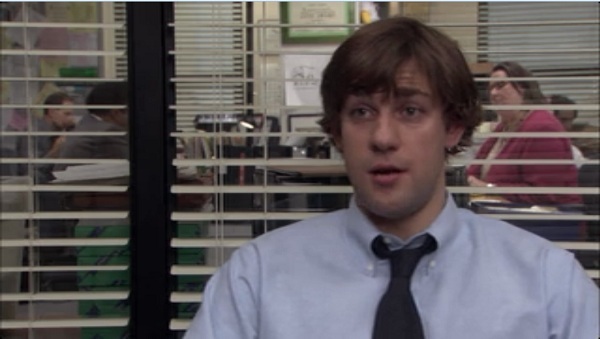 When Jim tells Michael that he was a great boss during “Goodbye Michael,” we think about the growth of those two characters, but we also think about how Michael was never a great boss (and in fact a regular theme during the show’s early years is that Michael is simply an excellent salesman in the wrong job). Just five years earlier, Jim told the documentary crew that he’d like to see Michael’s face clamped in a grill. As “Finale” started closing off its characters’ loose ends, some worked and some didn’t. For the few deserving characters like Jim, Pam, Erin and Dwight, the happy endings felt earned, and for the few not-so-deserving characters whose stories actually ended them in a karmically-appropriate place, like Creed and Kevin, the bittersweet endings were fitting, funny and even cathartic. But other characters’ endings felt hollow. Andy getting a cushy Cornell job – really, my least favorite thing about the finale – only works if the show is trying to get in a jab about the bureaucracy of higher education, which it clearly isn’t, and correct me if I’m wrong, but I think Nellie’s story basically ended with her happily kidnapping a baby. Similarly, I know we’re supposed to well up when we see the wood carving Stanley made for Phyllis, but we’ve known all along that Stanley is a grumpy, lazy man who cheated on his wife multiple times and whose divorce presumably estranged him from his daughter. I know there is one flaw in my premise, which is simply that I appear to be ignoring character development in favor of preferring a version of the show that the cast and writers may have outgrown. When I say that the show’s sentimentalizing of Dunder-Mifflin and its denizens is not in keeping with the original tone of the show, one could respond that the show was ultimately about a bunch of flawed people who grew to love each other and grew as people until the place where they worked became a home. Except that isn’t what it was about. Some of the characters underwent meaningful character change – the Halperts and Michael, for instance – but most of the characters underwent only slight revisions. We were just supposed to like them based on time and proximity, not based on any strides they made toward being better people. When “Finale” cashed in on our emotions as it said goodbye, it reaped big rewards for some of the characters’ resolutions. With others, it came back empty.